For years, Willie Baronet didn’t like looking at people living on the street. Then he started buying their handiwork. Willie Baronet is looking for a sign. He pulls his Prius out of a coffee shop parking lot near SMU and heads south on Central Expressway. He goes east on I-30 and, after a mile or so, pulls onto the service road. He slows down at each overpass, craning his neck in both directions. But it’s also 98 degrees outside, according to the car thermometer, and the streets and sidewalks are close to empty. Baronet turns the car around, then loops through East Dallas for 10 minutes before heading back to I-30. He still doesn’t see what he’s looking for. Baronet comes to a stop in front of the man. The stranger steps to the open window, expecting a donation. The man on the street pauses for a moment and looks down at the tattered, worn sign. He squints at Baronet. But the hesitation doesn’t last long. “How much do you want for it?” Baronet says. “How much would you give me for it?” the man says. “Okay!” The man doesn’t conceal his excitement. Baronet pulls a $10 bill from a small stack he’s got folded and jammed into a slot on the door handle. The man smiles wide—he’s missing a few teeth—and hands over the sign. Baronet hands over the money. “Thanks!” the man says as he folds the cash into his pants pocket. By now, traffic is building behind the Prius. Baronet slowly pulls forward, under what has been a green light for a few seconds now. Soon, though, he pulls over to the side of the road again and puts the car in park to examine his purchase. It’s about 12 inches wide and 10 inches tall, with deep lines from where it’s been folded like an accordion. He lays the sign as flat as he can on his lap and photographs it with his iPhone. Then he lifts it up for a closer inspection. “Look at the lettering,” he says, running his fingers over the indentions. “It’s thick, but it was done with a thin pen. Someone spent a lot of time making this, pressing into this.” He points out the patina, the layers of build-up, like an archaeologist discussing an ancient scroll. 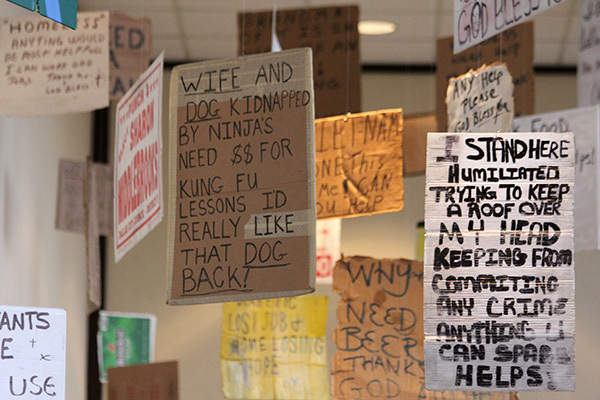 READING SIGNS: Baronet started buying signs from homeless people as a hobby. Now he uses his purchases as artwork to talk about the concept of home. 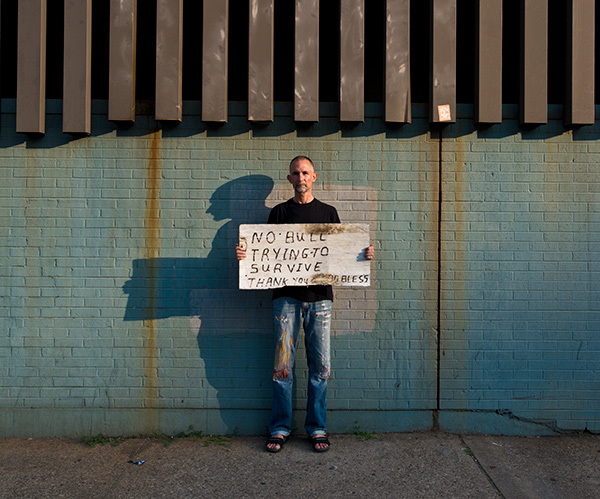 Baronet has been buying and collecting signs made by homeless people for 20 years. He doesn’t claim to be an expert on the homeless or homelessness. He’s an artist, an advertising professor at SMU. For 15 years he owned his own advertising design firm, then sold it in 2006 and went to graduate school. When he started, he says, signs by the homeless weren’t so prevalent. Before he started buying them, he had the same mixed feelings a lot of us have. He didn’t want to look at them. He didn’t want to see the people. He didn’t want to read their messages or think about their problems. He made up stories about them and wondered what they’d do with the money—or if it was okay to wonder that. Just seeing homeless people asking for money made him want to avert his eyes. It felt like a very subtle violation, like someone exploiting a loophole in the social contract. And he felt bad for feeling that way. He has found that in focusing solely on the signs, thinking of the interaction as a commercial transaction for art, he makes brief but real connections. He shakes hands. He isn’t afraid or disgusted or offended or embarrassed. He feels like now it’s a content producer—an outsider artist—and a broker, looking to negotiate a purchase. WRITING ON THE WALL: Before becoming a professor at SMU, Baronet ran his own advertising firm. The sign-buying adventures give him little rushes, too. Once he’s looking closer, thinking about the world differently, he’s excited to see what he’ll find—the thrill of the hunt. Each sign is different, with different textures, scripts, materials, and messages. Some have Bible verses. Some have emoticons. Some are funny. Some are crude. Some are sweet. Some are sad. Detached from their original context, some read like perverse poetry. There were visible bruises. There were dented doors. There was much worse—he’s been rebuilding his relationship with his father and doesn’t want to rehash the gory details now. There was fear. There were nightmares. “Let’s just say: I didn’t feel safe,” he says. His escape was always art. He’d open up a sketch pad and vanish into another world. He would get obsessed with the way things looked, with the tiny details he’d see when he focused intensely. He moved to Dallas in 1984 to work at an advertising firm before starting his own successful company. In 1993, he sat down and wrote a long letter to his father, confronting him about his childhood. He said he wasn’t going to be afraid anymore. He said he wanted a different kind of relationship. Three months later, his father wrote him a five-page letter he tells people is “the most prized possession I own.” The elder Baronet confessed his regrets and apologized. Son and father began to see the world through each other’s eyes, and they both saw things they’d never seen before. That same year, 1993, he bought his first sign from a homeless person. He can’t say with certainty when or where it was, but he thinks it was the Field Street off-ramp along Woodall Rodgers. He just saw a man with a sign, felt all those complicated things and—“it just sort of happened.” It was such a thrill, such an improvement over the mixed feelings he’d had before, that he wanted to try it again as soon as possible. He started noticing interesting little things about each sign: the different surfaces (a variety of different cardboards in a variety of conditions and colors, and more recently, thick, weather-proof plastic), the different types of markers and lettering. 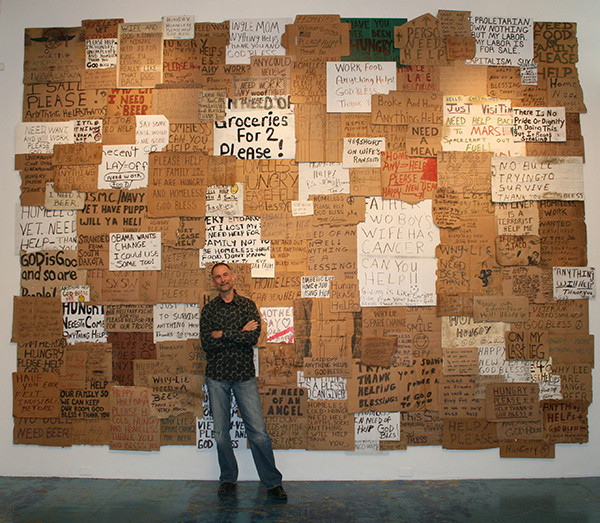 He has collected hundreds of signs over the years. He lost count long ago. They fill his life, from the walls of his office at SMU, to the stacks all around his studio in Oak Cliff, to the piles in the backseat of his car. Each has a provenance. Each tells a story. There’s the one-legged woman he met in Austin, with an incredible tale of a boating accident in her 20s. She had come remarkably close to death, and she was hilarious. Uplifting even. Her sign read: ON MY LAST LEG. There’s the guy who was so interested in this ambiguous art project Baronet spoke of that he held up traffic. And when the cars behind Baronet began to honk, the man flipped off the other drivers and screamed obscenity-laden directions to go around. “He really wanted to talk about art,” Baronet says. And the vet outside the pawnshop who sold him the exact same sign twice—and almost a third time. There’s the thin woman he met along a highway once. She was crying as she talked about her sign, explaining that it was made by her late husband. “She flipped it over and showed me his name,” he says. Other people send him photos and articles and anything related to signs made by homeless people. He recalls a project he saw that involved college students holding signs along the side of the road that said things like: NOT HOMELESS, JUST WANTED TO SAY HELLO. Baronet sold his business in 2006 and decided to go to grad school at UTD, for an MFA in arts and technology. It was there that he began turning his strange hobby into something more. In 2009, he had his first solo art show at Hal Samples Gallery in Deep Ellum. There were a lot of different parts, but it all involved his homeless signs. Some were attached to mirrors. Some were hanging from the ceiling, dangling right at eye level. Some were glued to the floor, and Baronet watched as people stepped on them and recoiled, worrying that they might scuff one of the battered, craggy signs. He paid a homeless man to hang out at the opening and mingle with members of the art community. He’s not sure about the ethics of all this. He knows it’s complicated. He questions whether selling him their signs is in the best interest of the homeless people. “I honestly don’t know if, in that moment, they have another sign, or if they have access to supplies,” he says. “I don’t know what they’re going to do with the money. I leave that up to them. It’s presumptuous for me to think I know anything about this person or their circumstances. I want to respect their privacy. In the end, it’s none of my business.” He stresses that he really doesn’t want to exploit anyone. He wants people to see the things in life that we usually avoid looking at. Not long after buying the accordion sign from the gaunt man in the tank top, Baronet is across town, checking the underpasses of I-35. At the Mockingbird exit, there’s a tall man with a long white beard and stark Confederate tattoos. Baronet pulls up and begins his routine. “How much?” the man asks. Baronet pulls out a $5 bill. “I’m working on an art project,” Baronet says. “I’m Jerry,” he says, signing his first name to the cardboard with a pen. There’s a firm handshake, and Baronet pulls away. He tells people that over the years, these signs have become the signposts on his own journey of self-discovery. He doesn’t know the answers to the questions he’s raising—or even if answers exist. He just knows it makes him feel good to do what he does. He’s enamored with the signs. He can’t stop. As he turns each sign, examining and photographing it, thinking about the effect it might have on people. He’s writing a book. He’d like to apply for a grant and travel the country, buying signs in every major city along the way. He gave a talk at TEDxSMU, and he’s done various storytelling performances around town, sharing his experiences. He was recently approached by a speakers’ bureau, where he was invited to speak to corporations and conferences. He talks about creativity, and what the idea of home means to him. Of course, he talks about the signs and seeing the unseen. Most of the time, he closes with a quote from one of his favorite movies, The Wiz—the 1978 reimagining of The Wizard of Oz starring Michael Jackson. It’s from the end, when Glinda the Good Witch explains that home is a state of mind. The words guide him. They’ve become his philosophy for life.